In the Mermaid Pose-1 your legs, bent to the side, look like a mermaid’s tail. But it’s Sanskrit name, Bharadwajasana, commemorates the warrior Bharadwaja, a mythical figure from the Hindu epic, Mahabharata. This pose, Bharadwajasana 1, rotates the spine, exercising the middle and upper spine particularly, dispelling stiffness and making your back feel supple. 1. Sit in Dandasana with the legs stretched out. 2. Bend both your knees and draw your feet up beside your left hip, then lift your spine. Put your hands on the floor by your hips and stretch your spine up. the hips to the right thigh and gently, pressing your right hand down behind you to lift and rotate further. 4. Breathing out swing your right arm behind you and clasp your left upper arm, place the back of your left hand outside of your right thigh close to the knee. Turn your head to look over your left shoulder and twist for 10 -15 seconds, breathing normally. 5. 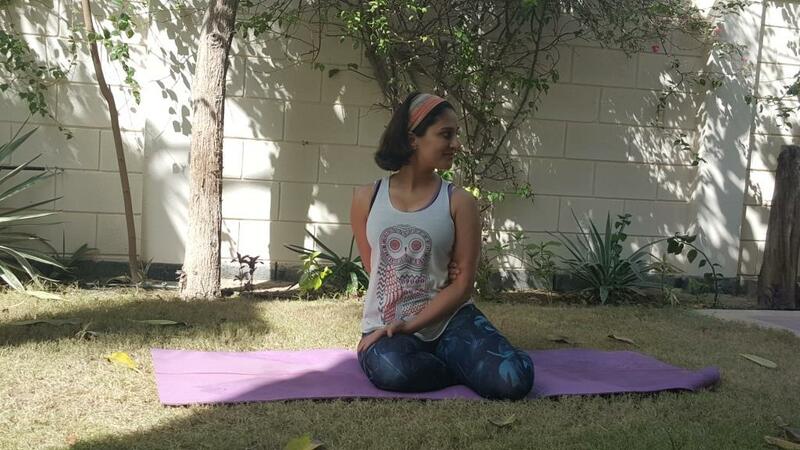 Turn to face forward and straighten your legs to resume Dandasana or rod pose. Repeat steps 2-4 this time drawing your feet up beside your right hip and turning to the left. l Turn your head, shoulders, waist and elbows. l Keep your shoulders in line. DON’T: l Don’t move your knees while turning. l Don’t disturb the balance of your hips when you move your feet or when you turn. BENEFITS: l Relieves sore backs and stiff necks.